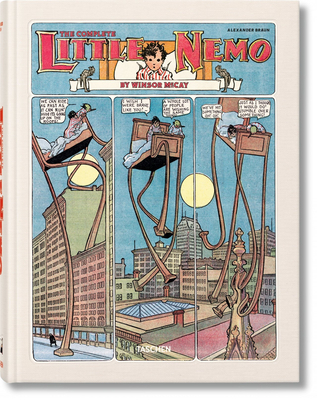 Adventures in pajamasThe complete Little Nemo compilation Meet Little Nemo, a diminutive hero of comic narrative, but one of the greatest dream voyagers of the 20th century. The master creation of Winsor McCay (1869 1934), restless sleeper Nemo inspired generations of artists with his weekly adventures from bed to Slumberland, a realm of colorful companions, psychedelic scenery, and thrilling escapades.Nemo's creator Winsor McCay was a founding figure in the modern American entertainment industry, above all with his revolutionary comics, which set standards for panel layout and storytelling technique, timing and pacing, and architectural and other detail that left an inestimable influence on subsequent artists, including Robert Crumb and Federico Fellini.TASCHEN's sumptuous Winsor McCay: The Complete Little Nemo 1905 1927 collects, for the very first time, and in full, glorious color, all 549 episodes of Little Nemo. In the illustrated accompanying volume, art historian and comics expert Alexander Braun places Winsor McCay's life and work within the cultural history of the U.S. media and entertainment industry, and explores the immense art historical value of McCay's dream narrative. At once an adventure story, visual delight, and piece of cultural history, this publication is a tremendous monument to one of the most innovative pioneers and one of the most intrepid explorers of comic history.